Whoa mama! It’s Bob Dylan’s Rez Day Party! The Bob will be 72 at the end of the week and we’re celebrating a couple days early at the Storytellers Pub in Winterfell Laudanum. 90-minutes of Dylan originals and covers by artists from Rod Stewart to Marlene Dietrich! Dress – Yes, definitely. Shirts and shoes required. Cravats optional. Just wanted to give a quick shout out (you can tell I’m just back from the 21st century, can’t you?) to the folks at one of Caledon’s newer watering holes. Finally had the chance to hop over to the Book and Tankard Pub in Victoria City, Miss Beth Ghostraven, proprietress. It is located conveniently next to the Caledon Library buildings, from whence it gets, I suspect, the part of its name that does not come from the fact that it is a pub. The Book and Tankard is a well-appointed spot to pass the time with a good book in a comfy chair or sofa by a nice fire, these spring nights still holding a bit of chill in Caledon. Or you can sit at the bar itself or, when the weather permits, outside on the porch with a view of the center of Victoria City and watch the librarians pass by. Should you stop in for a tankard of ale or something else from the fine selection of beverages, do tell Miss G that Ambassador Whitfield sent you and she will see that you are well cared for, I assure you. That’s what it says on my business card. At the bottom. Below the current stuff. I’m talking about the personal business card, not the official one. The official one just has the one title: Winterfell Ambassador. When you’re an ambassador, you don’t put other titles on your business card. I put Diplomat in there because it does raise eyebrows. As does Explorer. Writer, eh. A lot of people call themselves Writer. Diplomat and Explorer kind of offset the roll of eyes over Musician. And, Pub Owner, well who doesn’t like a Pub Owner? That top line is fine, I’m not changing that one at all. It’s the bottom one I’ve been thinking about a lot. For a few months now. The Time Traveller part is fine, that’s still true. And yes, I use the British spelling. I just do. I think of it as the Victorian spelling. It’s the Semi-retired that I’m losing sleep over. That may be an overstatement. But if you’ve been following along with the stops and starts of this journal, you may have wondered about it yourself. I seem to spend more time moving between centuries and worlds than I have in years. Back when I made my living at time travel, I had a rather unusual schedule. At times it was rigorous, at others it slowed to a crawl. It was basically a free-lance business, working for a client until the job was done and billing accordingly, although some clients had me on retainer. The latter, by the way, was the only way I would do government jobs. Money upfront when you’re dealing with those rascals. Good luck, completing an assignment and trying to get paid otherwise. If they’re not paying you regularly, they’re not paying you at all. Damn bureaucracy. It was the nature of the business though to have a ton of work for awhile and then have little to do for weeks at a time. Months even. That’s when I’d write a guest column for a newspaper or magazine and give a lecture or two. (Of course, I could usually pick up some cash on the side in another line of work, playing music.) It was in those days, when I was in between missions, that I would joke with my friends about being semi-retired. Later, when I did leave the trade to allow myself to find a time to settle down in, I thought it would bring a laugh if I put semi-retired on the business card. And I knew it would keep me in the loop if a particular timejump assignment came up that caught my interest. I remain a member of the Guild and I’ll go into the club from time to time, so I’ll hear about jobs. If I’m interested, I pull out the business card so an appointment can be arranged. If not, I just listen and act ambassadorial. But over the past many months, as you’ve seen, I’m here, there and almost anywhere. There are so many more worlds to travel to these days. And with this hypergrid movement now, well by God even amateurs are doing it! So it can come in handy to have the resume and bona fides of a professional. There is tall money to be made for short work, if you have the experience. Plus, I am doing so much time travel for my own personal business reasons now that I’m just not as semi-retired as I used to be. So, maybe I should strike that phrase from the title and the business card. Whenever I think about that, it causes me to wonder if I should change the name of this journal as well. As much as I am still a man of the 19th century, I just don’t get to spend as much time there as before. And so far, every time I think about changing the name of my journal, I stop thinking about all of it. It’s just too difficult to decide. If I did decide to do it, then I’d have to think of a new name. There’s just too much thinking involved all the way ’round. Maybe it’s better to do nothing. In February, I posted a piece here called Another World. It told of a new second home I’d found in the 21st century in a world that was only a couple weeks old. A world called Aurorascape. I wrote that I wasn’t sure what I was going to do with a free parcel I acquired there in a nice lakeside neighborhood. What I decided on was to put a pub on the land. As the world was new, I thought a gathering place would be a good contribution to the community. I built a new version of The Evergreen Pub as, at about that same time, I was closing The Evergreen on the Mainland of Second Life. As I have noted on these pages before, I am not a builder. Yes I know how to put prims together neatly – and I can do a good job modding someone else’s build – but I have no eye for design. But looking for a pre-fab build for a pub in OpenSim and Aurora-Sim worlds would have been a big waste of my time. I have visited enough OpenSim worlds to know this. Heck, the pickings for pre-fab pubs or bars in Second Life are slim. I know that well after nearly six years in that world. I thought about asking the builder who did the custom job on the original Evergreen Pub if I could get a copy I could export elsewhere – and I may yet ask at some point – but tracking her down and going through the process was going to take time. And I wanted a pub now! So I would have to build one. I decided to keep it simple. A small corner bar of the type that you might find tucked into a tiny commercial area of a mostly residential district. The classic “neighborhood bar.” I put my build together and furnished it and announced it’s opening. It only took up about a quarter of the parcel. I scattered some trees and plants around the rest of it with the thought that I would leave it that way until inspiration struck with the answer to what else to do with this spot. The important thing was that I now had a base in this world. A place to watch the world grow and a place that might draw the occasional visitor from among the other early pioneers here. A place for me to hangout when I was inworld and to maybe make a friend or two. It was exactly what I needed. Although my pub building was simple, I was happy with it. It was a good enough build and I had created a nice atmosphere with the furniture and wall-hangings inside that, for once, I was not embarrassed to say it was mine. But I had no idea how it would turn out, so I didn’t build it at ground-level. I didn’t want anyone to see it until it was done. I built the pub on a building platform I had placed high in the sky. And once the pub was open, I started to build other things on that platform. For, at the same time I was putting down prims in Aurorascape, I had begun another project on another world, Kitely, where I already had a presence hosting and caring for a few of the Devokan ages. It is a very large project but the cost in Kitely was minimal. And I found a way to do it for even less than advertised. I thought my new pub would fit nicely in that project so I learned how to export it from Aurorascape to Kitely. Then I investigated a 21st century tool I’d heard tell about called Sim-on-a-Stick (SoaS). I didn’t think it was something that would work for me as I’m not knowledgeable about the technology of the 21st century. But it turned out to be so simple. And it didn’t cost a cent. I realized I could build my big project at no cost offline on SoaS and then upload it to Kitely when it was ready. This led to further ideas about additional projects. And I started work on those (on SoaS) as well. And that led to a complete re-think of how I would plan, build and display my projects in the future. And all this was happening at a time that a fellow member of the Devokan Storytellers group, Ruby O’Degee, had been talking and writing about a craft she had taken to calling “Storybuilding.” And I realized not only had I engaged in storybuilding before but that I was now at a place and time – and equipped with the tools and ideas – to jump into storybuilding with both feet. So I jumped. You could find me every day and every night working on one of my projects in SoaS. Well, actually you couldn’t find me. That was one of the cool things about SoaS. I could do all this work out of the view of others. Storybuilding is quite like story-writing. At least for me it is. When I am writing a story, I don’t want someone looking over my shoulder. Same with storybuilding. I was now so busy that I began to wonder whether I really needed my free space in Aurorascape anymore. But I only could begin to wonder as I was much too busy to engage in a full-fledged wondering. I had several ongoing writing projects. 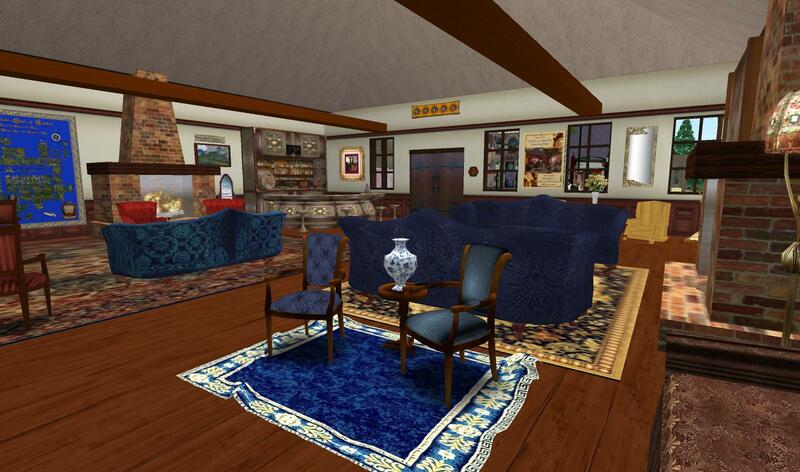 Some I would work on in the first world but others I would pursue at my cabin in Winterfell in Second Life. That was also my getaway when I needed to stop myself from writing more or had to take a timeout from my new storybuilding projects in SoaS. I also had been reappointed Winterfell Ambassador and there were duties to carry out. 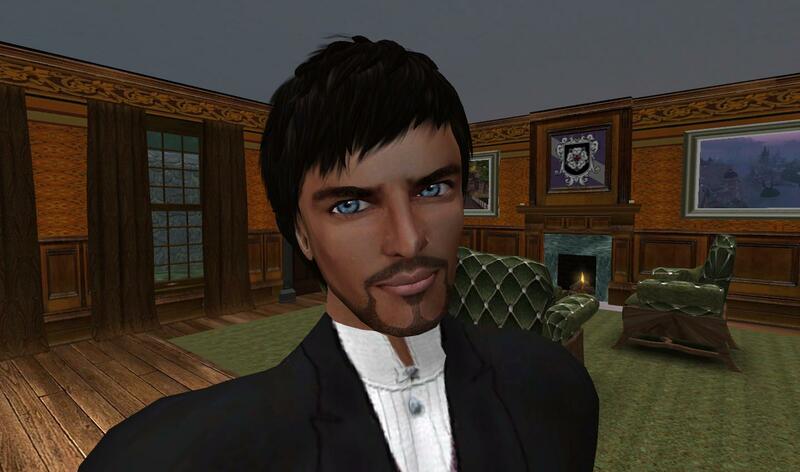 And I’d become extensively involved in exploring other virtual worlds around the Metaverse. Plus, I had the Devokan ages of Evergreen in Kitely to watch over and the Devokan Storytellers’ gatherings on Kitely to organize and attend. So with all of this, when would I have time to spend in my pub in Aurorascape? But I didn’t want to leave. It was a new world and it was growing rapidly and I wanted to watch that happen, who knows where it would lead? But then came the sad news. As quickly as Aurorascape was growing and as fast as word of it was getting around and causing others to come in for a looksee, there were unexpected outside issues that its creator, Timothy, believed would prevent this new world from developing as it should and could. So he announced that the world would close. Unlike some ventures where you just show up one day and the world and all your projects and belongings are gone, Timothy gave us all a heads up and the time we needed to wrap things up and pack them and take them to other worlds. In the short time – a few weeks – that Aurorascape was around, it had a big and positive impact on me and some others I met there. And together with the things I was learning elsewhere at the same time, it changed my virtual life forever. It was also a blessing as my typist was going through a rough patch with his health throughout this period. 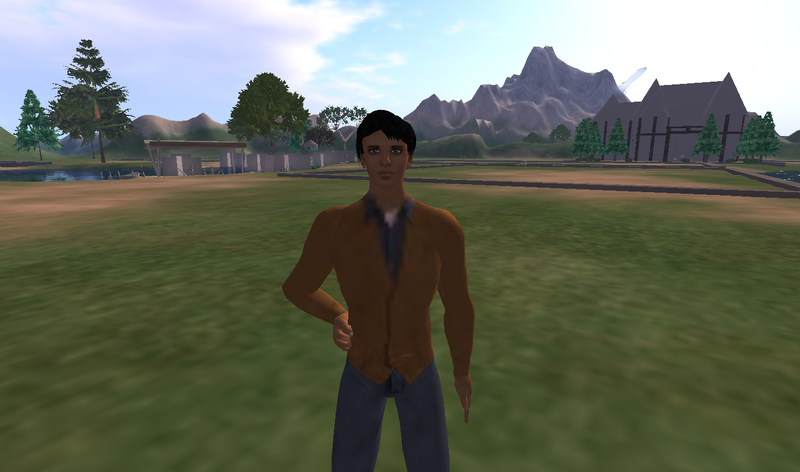 All of these happenings in the virtual worlds gave him something to focus on and made his daily life bearable. But because of Aurorascape and where it helped lead me in my virtual life, it was a time I will never forget and will always look back on fondly. It really is a new chapter, maybe a whole new book, certainly another new beginning. It gave me a new outlook, a new approach, and many new projects that will keep me happy and busy for a very long time. Last day in Aurorascape. Standing on my parcel after removing the pub. I have been writing this (mostly) RP blog, Steaming Along: Danko Whitfield In The 19th Century, for three years now. So it’s a bit daunting for a new reader to know where to start. I’m thinking about creating a category or page called Danko’s Favorites to give a new visitor a place to jump in. For now, I thought I’d share with you here the ones I’ve picked out so far….